The Joker of DC Comics is probably the most well-known supervillain in all of comic book creation. Originally created by Bill Finger, Bob Kane, and Jerry Robinson in 1940, this character has evolved and changed with the times—reflecting back a dark and twisted mirror of the worst of society’s fascinations. He has gone through many metamorphoses but remains as difficult to portray and grasp as the day he was first inked to page. Throughout the years the Joker has been shown in many different lights, in many different mediums, by many different people. However, how faithful have these depictions been? What are the constants, and what do they tell us about the Joker himself? In truth, it is difficult to say, but I will attempt to shed some light on the matter. If you are, or aspire to be, a comic historian, it becomes easy to blame the Joker’s apparent lack of rationality on the fact that he is a product of the Golden Age of comics. Between the 1930s and 1950s, comics went through a very stylistic period. This era brought us some of the best heroes, like Superman and Batman, but it can also be criticized for being ridiculously simplistic. In the Golden Age, bad guys did bad things because they were bad—and to give the hero a chance to stop them. Based off of that, the Joker doesn’t need any motivation because he is simply there to lose. In my opinion, thinking this way does a disservice to the characters that have survived past the Golden Age. Many of those fan favourites are still around because at their core, there’s something more to them than good versus evil. Case in point: The Joker and Batman have never been mere rivals. They have always been a convoluted and incompatible binary. One embraces responsibility and duty, while the other gives way to maniacal hedonism. But we’re getting ahead of ourselves. 1988 brought us The Killing Joke by Alan Moore and Brian Bolland. In this graphic novel Moore and Bolland explore the Joker’s origin, loosely basing the narrative around The Man Behind the Red Hood!—a plot arc written by Bill Finger in 1951 and originally published in Detective Comics #168. The Killing Joke is a classic and it is considered by many to be the penultimate in terms of defining the Joker’s character. 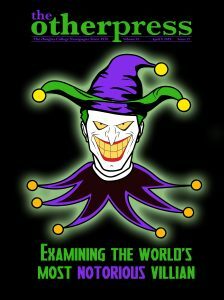 It does give us a very key insight into how the Joker sees himself and those around him. To put it blatantly, the torture and pain he inflicts on others doesn’t register as a permanent state to him. He is singularly focused on achieving whatever he has set his mind to. The way he dehumanizes others is juxtaposed against his own origin story in the comic, which almost humanizes him. It is a very methodical and difficult narrative to unpack in any simple way. The key point to his backstory is that through a series of unfortunate events—a failed stand-up comedy career, a dead wife, problems with the mob, and an unfortunate accident that leaves him disfigured—a Joe Everyman becomes the greatest villain of Gotham. On paper, it has all the makings of a sympathetic villain backstory—but through all of it, the reader is aware of the Joker torturing Commissioner Gordon with images of his naked daughter, Barbara/Batgirl, after the Joker shoots her and she is bleeding out. Add that to the fact that the Joker’s prior self was so pathetic and self-centred that he could have been easily blamed for his own fate, and that sympathy goes out the window. What I think many people miss about The Killing Joke is that you’re never really supposed to sympathize with the Joker. His apparently tragic backstory is, I believe, a red herring. It is a surface attempt to justify his behaviour, but in a way that only makes sense to him because he is so utterly focused on telling his own story. The proof of this, within this narrative, comes with the context of who the Joker is attempting to prove his point to—Batman. Batman, like the Joker, suffered a series of unfortunate events. However, his life and outlook are drastically different than the Joker’s even despite his own trauma. Due to this, the reader sees the Joker not as someone who fell on hard times and was driven insane—but rather, as a character who is completely immoral and myopic. He has every reason to feel empathy, but somehow just doesn’t. This notion of being emotionally disconnected is a characteristic of the Joker that has survived through his entire history. However, his curiosity over other people’s reactions and how far he can push them is a more modern concept. Post-’80s, we see more and more of the Joker seeking to “break” Batman—in reference to his moral code. This goal is curious because Batman is a vigilante at his core, meaning his moral code is fairly accommodating. For this antihero, there are only two constants—no guns and no killing. So, what is the Joker’s intention? To die? In some cases, yes. In the game he has developed in his own mind, he wins when Batman kills someone. If that happens to be him, so be it. The only thing that seems to matter to the Joker is that he wins. The lengths to which he is willing to go, and who he is willing to go through, don’t matter—because they are a means to an end. Never is this more apparent than in Judd Winick’s Batman: Under the Hood. This comic arc ran from November 2004 to March 2006 intermittently, and spans across Batman #635 to 641 and #645 to 650. In 2010 it was made into an animated film, Batman: Under the Red Hood, also written by Winick. In the film, the Joker beats an adolescent Jason Todd (the current Robin) to death with a crowbar in an attempt to force Batman’s hand. After Todd returns—because no one stays dead in comics, sorry Uncle Ben—he also becomes obsessed with making Batman kill the Joker as retribution for his own death. When Batman refuses, the Joker taunts him and tries to goad the hero into killing him. A unique response, to be sure. This idea that the Joker does things to prove that everyone is capable of monstrous acts has become an accepted norm in his behaviour. Something that you might not necessarily question because it is so constant. However, that doesn’t mean that you shouldn’t challenge it. In 2008 the world was introduced to Christopher Nolan’s version of Batman in The Dark Knight. Nolan’s universe is not considered canon, meaning it is seen as a world apart from the DC Comics’ interconnected fictional multiverse—the one that houses Batman, Superman, and the Justice League. However, The Dark Knight did give us a new version of the Joker that was built upon concepts and observations from previous iterations of the character. In Nolan’s universe, the Joker is a chaotic sociopath brought to life by method actor Heath Ledger. One of my favourite things about Nolan’s Joker is that he exhibits this constant and obviously false pandering for sympathy. The Joker repeatedly tells the story of how he got his disfiguring scars, but the story is always different depending on who he is talking to. This is key sociopathic behaviour—lying and attempting to mimic emotion to garner support. This behaviour isn’t new to The Dark Knight either—in Batman: The Animated Series, which ran from 1992 to 1995, one of the Joker’s most influential and key relationships is with Harley Quinn. Quinn is shown as being utterly devoted to the Joker; however, it is obvious to the viewer that he only mimics a similar devotion when he is in need of her assistance. In the cartoon this is played off for laughs and very rarely has any serious overtones. That doesn’t change the fact that the Joker doesn’t have any emotional investment even with his closest allies—another potential affirmation of this character’s sociopathy, even at the earlier stages of his development. Recently a trailer for the upcoming film Joker was released. The film is set to debut in theatres this coming October and stars acclaimed actor Joaquin Phoenix as the titular clown prince of crime. Visually it looks very Nolan-esque in that there is a realism factor that may preclude the film from fitting into the DC Comics multiverse. However—and call this pre-judgement if you will—my concern is that the film will attempt to humanize the Joker too much. It seems to run along the same lines as The Killing Joke, but the juxtaposition with Batman to emphasize the immorality of the character will be absent—instead replaced with an ailing mother who will probably die in order to catalyze a devolved mental breakdown, and a rebellion against those in power. This changes the Joker character by giving reason to his emotional absence and turning his disconnect into anger—thereby almost nullifying the spontaneity of mental illness and turning it into a cause-and-effect scenario. This logical link is problematic because it creates the expectation of reason behind emotion, which—as many sufferers of depression, anxiety, and other mental and psychological disorders know—is far from always being the case. The Joker is a vital character in comics and in fiction more broadly because he acts as an example of how sometimes, there is no reason behind one’s actions. Together with Batman, the pair stand as the archetype for dynamic character outcomes. The duo is a literary representation of two similar backstories diverging into polar opposite results. One, a duty-bound vigilante with nothing but his work and his personal sense of justice; and the other, a maniacal hedonist only interested in proving that everyone is capable of atrocity.